I can remember having a huge sticker collection as a kid, now my kids are doing the same. Especially my daughter. They have stickers on their toy box, on their bedroom walls, notebooks and even sticker books filled from front to back! I can't even begin to name what types or how many stickers they have all together. StickerYou stickers are waterproof and removable. Use them indoors and outdoors, over and over again! From stickers to address labels to bumper stickers! 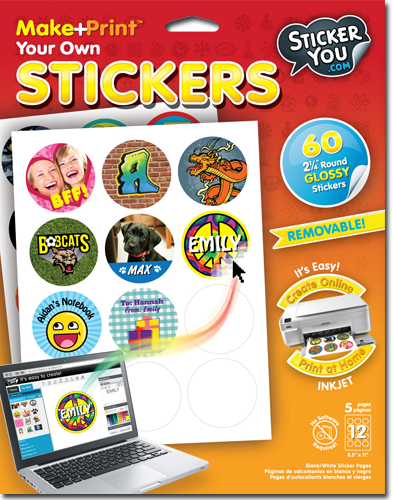 StickerYou offers the ultimate freedom for anyone looking to create stickers with our free form die-cut sticker printing. Whether you're using our art and brands, or uploading your own images, each sticker looks awesome! Perfect party favors or gift tags and are a great way to advertise an event, business or blog! I love the fact that they are durable, not that those thin stickers that rip in half at the slightest touch. You can choose to have one sheet full of the same sticker or a sheet with a variety of stickers. The choice is yours. The only issue will be making the decision of which stickers to create, which proved to be difficult for me! You can purchase Home Make+Print products at Hobby Lobby in the USA and Mastermind and Scholar's Choice in Canada.